The compact label printers CL-E321 and CL-E331 from Citizen convince in every respect wherever they are used. They are true all-rounders, ones that master label printing in both thermal transfer and direct thermal mode. The CL-E321 and CL-E331 print labels at a speed of up to 200 mm/sec. The CL-E321 has a print resolution of 203 dpi, the CL-E331 300 dpi. When installing the two are very straightforward. They may be integrated into any system via USB, RS232 and Ethernet; via a LinkServer management tool also via the web browser. If you like, simply send these smart label printers print jobs from your smartphone or tablet. Speaking of »simple«: the CL-E321 and CL-E331 have two tear-off edges - one at the top and one at the bottom of the output slot. This makes it easy to remove printed labels from any angle. 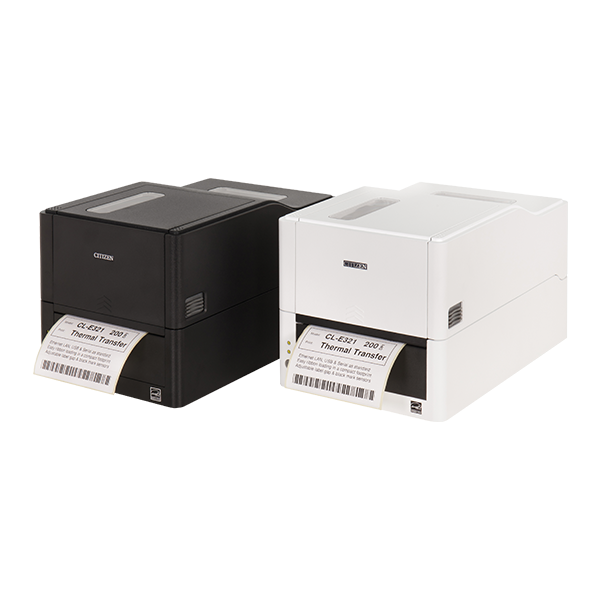 If only everything in the workplace was as user-friendly to operate as the Citizen label printers CL-E321 and CL-E331! Order the Citizen label printers CL-E321 and CL-E331 with your sales representative. Give us a call today!